Jersey Fest Fair 2013 was held at the Crowne Plaza Fairfield hotel in Fairfield, NJ, September 13th through 15th. 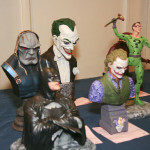 According to their website, this is a new show that started out as a gathering/party for mostly figure modelers in 2006, and only last year in 2012 did it graduate to public venues with open attendance. 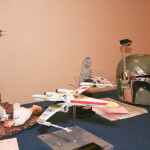 The event this year consisted of a good location at the Crowne Plaza, two nice sized vendor rooms with all sorts of figure and science fiction related materials and supplies, a model contest that drew some exceptional talent (photos below), and many seminars that covered everything kit assembly airbrushing. Artists Lorne Peterson (of ILM and Star Wars fame) and Steve Wang (of Predator fame) were also on hand to give presentations on their respective careers. I was only able to make one of the days due to work and other commitments, but I made a full Saturday of it. This was one of those occasions where I “knew” several people in attendance, but only through internet message boards; it’s always good to put a face and a voice with a name. As stated, the vender room content was almost exclusively science fiction kits, resin figures, and a couple of hardware vendors (Badger and Iwata had tables). The contest room was a little small, but jam-packed with models. You can still see the figure painter origins of the show in the number of those on display, but there was a sizable science fiction model showing as well, with lots of great Star Wars, Battlestar Galactica, mecha, and other hardware on display. From all accounts the show will be back next year. I’m not sure if it’ll be in the same venue, but if you’re into science fiction and/or figure modeling, then find out where it is and go. It’s well worth the trip.